I'm not a Christian. That should be easy to figure out [I remember seeing this bumper sticker that said: "I don't have a problem with Christ: It's his followers I can't stand"]. That's not exactly true; it's some of his followers that I can't stand. Like the occasional person who emails me and tries to convert me. This never goes well and I usually wind up accused of not liking any Christian. Plus, with all this hate being spewed around about the LGBTQ and Muslims and Sihks, I feel like I need something positive to balance the negative-hate-crap that I complain about all the time. I really want to represent Christianity in a positive way for my Christian friends who constantly remind me through their thoughtful actions that there is more to their religion than the hate that makes the evening news (I ♥ each and every one of you). So, I've been looking around for positive Christian things to blog about and it's the bibliophile in me that propelled me toward books. It's taken a while - I've been looking for weeks. I'll admit, many of the books that I found made me groan inwardly. I did try to read a couple of them and this made me groan outwardly. I also don't finish reading those books, which isn't like me. I hate to leave a book unfinished. Then, one day as I was going through the giveaways on goodreads, I stumbled on this book, Sisters of the Last Straw: The Case of the Haunted Chapel by Karen Kelly Boyce. It is the first in a Christian series designed to teach acceptance and tolerance. I don't know what it was - the cover art or the intended message that needs to be remembered in ALL religions right now - but something kept drawing me back to this book. I contacted Ms. Boyce and she sent me a copy of the book to review. 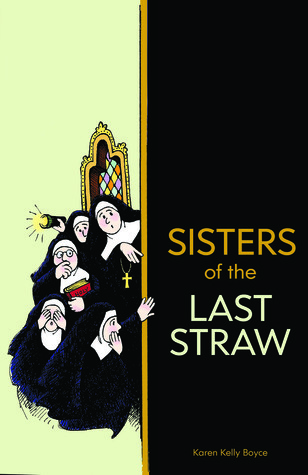 Sisters of the last Straw is the story of a group of misfit nuns who solve little mysteries. It is comical - containing lots of slapstick and prat falls. While is is entertaining it teaches the Gospel lesson of tolerance and the need to help others. Written for children at a 3-5 grade level, it has delighted younger children who like being read to. This is the first of a series of books involving the nuns and their adventures.